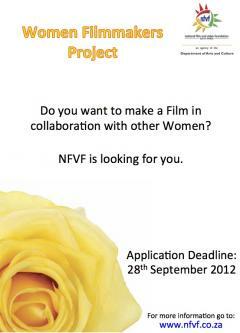 05 September 2012: The National Film and Video Foundation invites all eligible female filmmakers to respond to the Call for Proposals for the production of a low budget film aimed at female filmmakers as part of the Tier 2 development process. The concept for the Female Only Filmmaker Project is to provide recent female entrants into the industry, particularly those from historically disadvantaged backgrounds, with an opportunity to make a film in collaboration with other women. Successful applicants will be guided in the development of their stories into 48 minute scripts over a period of 5 months. The ten best scripts will then be work shopped for camera in preparation for the production of the films over a five week period. During this process each director will be provided with the necessary tools to break down scripts for camera as well as detailed strategies for extracting the best performances from the actors. Finally, a special premiere of three of the best completed films as chosen by their peers will be held at a suitable venue to be confirmed with the cast, crew and creative personnel as well as NFVF council and staff. a. Have worked in the industry for at least two years. b. Have worked in one or more of the following: writing, directing, editing, cinematography or producing. c. Be a Historically Disadvantaged Individual as defined in the constitution of South Africa. d. Be able to set aside the requisite time over a period of 9 months to complete the programme. Have a strong written concept for a one hour stand alone film with a clearly thought out premise or controlling idea that would allow it to be packaged with at least 4 other projects. Have a showreel that demonstrates their creative abilities. Have written, directed, photographed or edited two or more short films, documentaries or commercials. 1. Narrative treatment for one hour film including character bible, detailed synopsis, major turning point document. 2. CV and copy of ID document. All applications must be submitted as hard copies to: Thandeka Zwana by the closing date. All enquiries may be directed to Thandeka Zwana.